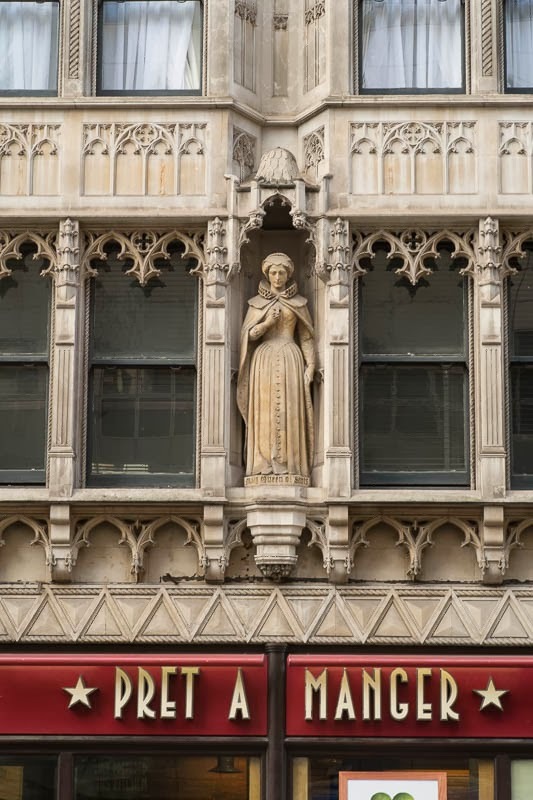 An ornate building on the Strand with a statue of Mary Queen of Scots now houses a lunch bar of the Pret chain. The building was originally designed for a Scottish Insurance company, the developer was a great admirer of the young queen and commissioned this tribute to her. Is it a declaration of his faith? It's from a era when art frequently was part of the decor of buildings. Much better than the blah glass towers of present day. She was too snobbish for a sandwich bar anyway. Great spot this, most would miss it. She seems to have been imprisoned everywhere else so why not a sandwich bar? It's always interesting to look at buildings above street-level. It really is a beautiful statue and I bet it's missed by most passers by. Wonderful statue of the queen! Beautiful! You don't see this kind of work in buildings anymore. Not only is the statue wonderful, the Gothic gingerbread details are terrific. It always pays to look up! It is a beautiful tribute to Lady Mary. Great shot! !